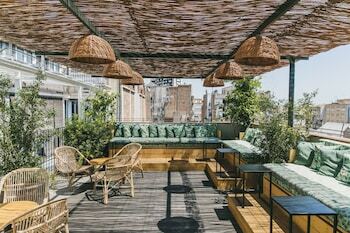 Located in Barcelona (Eixample), Hotel Casa Bonay is within a 15-minute walk of Palau de la Musica Catalana and Casa Batllo. Featured amenities include complimentary newspapers in the lobby, dry cleaning/laundry services, and a 24-hour front desk. Guests may use a roundtrip airport shuttle for a surcharge, and limited parking is available onsite. A stay at this apartment places you in the heart of Pamplona, steps from Plaza de Toros de Pamplona and Plaza del Castillo. With a stay at The Roof Top Duplex in Sitges (Sitges Town Center), you'll be within a 5-minute walk of Can Llopis Romanticism Museum and La Ribera Beach.